When it comes to marketing, the use of newsletters for communication between you and your customers can be a powerful tool. There are different forms of newsletters but one of the best (visually) is the HTML version. They allow you to track how many people opened the email, they allow you to put images, flash audio or video content and they have a much higher opening rate compared to plain text emails. 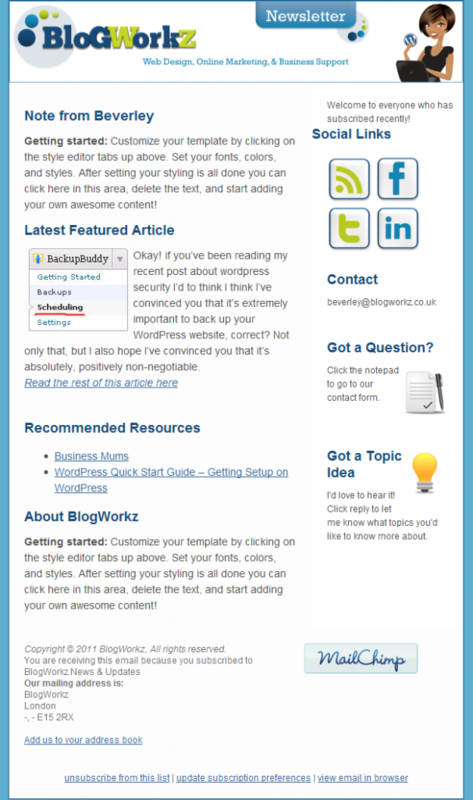 I found a great article on www.freemarketingzone.com that weighed out the pros and cons of html newsletters. I have included them below. Attractive Content – HTML emails offer better looking content than plain text emails. You can decide about elements such as layout, colors, text, and even background. You can also include images, videos and audios which allow you to create good looking newsletters that your visitors will WANT to read. Better Response Rates – It’s been proven many times that the HTML format outperforms the text format. People are simply more interested in reading HTML designed newsletters. When they receive tons of messages a day in their inboxes, readers are more prone to open an email newsletter that has captivating headlines and attracts attention through visually appealing images. This custom html newsletter design is a 2 column layout which incorporates all of the elements of the client’s website design (header, background color, and custom social icons). You will also see that there is a section at the top to add a teaser or an explanation of the subscription info. At the bottom of the newsletter we have included an option for readers to share the newsletter on Twitter, Facebook and even via Email. And at the very button we have included an unsubscribe option which is super important and should always be included on any newsletter. This is another example of a newsletter / ezine type design that we did for one of our clients. 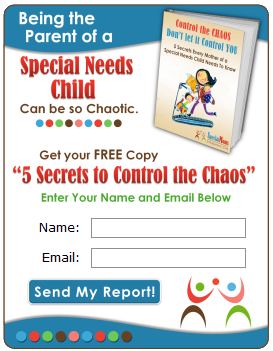 They have sections for each particular topic that they write about on a regular basis. We even added custom title bars to match the design and add more visual interest. And if you want to keep it a little more simple, this is a design done without the custom title bar graphics. More Advertising Suggestions – Advertisers will contact you more often, because you provide HTML newsletters. Not only because HTML newsletters have a higher response ratio, which benefits advertisers. HTML emails also allow advertisers to use flash or image banners and receive a higher click through ratio. Insert Forms Into Emails – With HTML emails you can include various forms right into the message. Your readers don’t have to click a link to go to a website and submit a form. You can have your optin or survey right in the newsletter and have much better response ratio. Ability to Track the CTR – HTML emails allow you to track how many people open your emails. Text emails don’t have this ability. Of course, you can track links that are clicked in the email message. But if you don’t provide any links, then you won’t know how many people took action. So HTML emails are way ahead of plain text emails in this case. Delivery Rate – Spam filters are implemented in almost every email service. Many people have enabled spam filters on their accounts. Most filters are enabled by default. HTML emails are considered to be spam by most of the filtering software. So when you send out a HTML email, it’s much more likely it’ll be filtered out. Font Problems – With plain text emails readers can set what kind of font they want to see in emails. When you send out HTML email, the reader can’t control the size and type of the font that is presented. However, majority of readers don’t even know how to change the font style in plain text, so they usually see unattractive Times New Roman font. Security Reasons – HTML emails have bigger chances of having a trojan horses, viruses and etc. Some email clients have blocked the downloading of external content (images, scripts). So a reader will not see a HTML messages as it suppose to be when they first see it. Size of the Email – Naturally HTML emails will be larger, because additional lines of HTML coding will be added. If you decide to send multipart alternative messages (both text and HTML at the same time), then the size will be even larger, which can eat your bandwidth if you have a huge list and small hosting account. Formatting Time – It takes longer to format the message in HTML. If you use many columns and use many images in your newsletters then it might be a hassle trying to send out HTML and text messages. This is one of the reasons why so many marketers prefer simple text emails. Downloading Time – There are still people who use dial-up internet connection. So if your HTML message is heavily formatted and is quite large, then dial-up users will have to wait for a while to see your message, especially if there are images presented. In spite of the negatives, people are still choosing to go with html newsletters as opposed to text format newsletters. There are a few key points that need to be understood as you go forward with html email newsletter marketing. For the lay person who does not understand what HTML is, to put it plainly, it is the code used by designers to make a site, blog, and even an email newsletter LOOK pretty. How does one go about presenting this pretty newsletter so that people not only open it, but continue to open it each time you send it out? Don’t Just Attach It – The most important thing to know about HTML email is that you can’t just attach an HTML file and a bunch of images to a message and click send. The obvious reason why you can’t do this is because your recipients’ email applications will break up the code and make the newsletter very unattractive and cause issues with your server. You also can’t send email marketing material right to an email without permission. Not even to your family and friends. It is against the law! 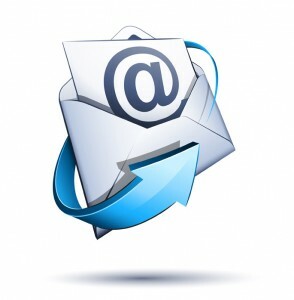 Need An Optin Option – When you want to send out an email newsletter it is important to have people sign up for it. There are a number of ways you can accomplish this and one of the easiest ways to get it done is to actually use a sign up form. You know those boxes that you see when you visit websites and blogs and some have arrows pointing to them so that you are enticed to subscribe? On the right is an example of one that we did recently to match a client’s site / branding colors. A subscription box is the most effective form for building your contact list. From our previous usability testing for various clients, we know that users often decline to subscribe to a newsletter, to avoid being overwhelmed by the amount of emails that arrive in their inbox. They are more likely to sign up for a newsletter when they can see the benefits in subscribing, and to continue the subscription when the newsletters brings enjoyment to them. They are also more likely to optin if there is some kind of incentive like a Free Report, Ebook, or Audio on a subject of interest. Visual Appeal – The most appealing part of an email newsletter is the actual layout. Some HTML templates are just plain boring. An email newsletter template should be appealing. The color scheme, images, and fonts should all have a flow. You want to make sure to brand your newsletter just as you brand your website, and other elements of your business. A visual appealing html newsletter is not overwhelming but it is appealing and attractive. Relevant – Your HTML newsletter needs to fit your marketing niche. Whether you are a blogger, coach, or an internet marketing expert, you have a market; and those who register for your newsletter want to learn more about what you know. Talking about your child’s soccer team and their losing streak will do nothing for your market unless you twist it to fit a topic that is relevant. A relevant topic is one that speaks directly to your market’s needs. You got them to sign up because you promised to share tips, ideas, content that will be of interest. Speaking to their problems is one thing; but helping them to them is another. This is why you want to make sure that the content you provide speaks directly to them in an interesting and relevant manner. From the perspective of an email user and one who often opts into e-newsletters, there are many things that customers like and will read. The goal of your e-newsletter should be to have the customer read your newsletter rather than hit delete immediately. Maybe they’ll even forward the email to a friend, tweet it on Twitter, or even share it on Facebook. My 2 personal favorites when it comes to email newsletter / autoresponder / optin programs are Mailchimp and Aweber. I will be doing a post to compare them both very soon, so stay tuned!